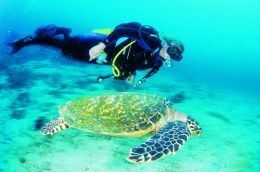 Falling into the simplest cliché is very, very easy but how can we avoid this terrible trap when talking about cruising the Maldives? Boaters, sea, diving and fishing enthusiasts, sweet idleness lovers lying on a hammock on deck or on a beach with fine white sand... The myriad of islands and islets of that Republic of water, sand and palm trees seems to have been laid there for the joy of seafarers, enclosed by a coral belt which does not hamper the wind but prevents the building up of waves thus allowing smooth sailing. 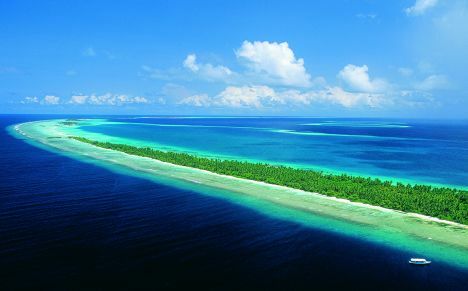 So, cliché or not, banality or not, time and again we decide to spend our holidays on these islands and every time we are newly fascinated by the beauty of the atolls, the sparkling white beaches and the gleaming emerald green lagoons standing out on the deep blue sea. 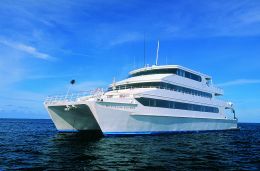 The Four Seasons Explorer is 128-foot long aluminum catamaran, with a beam of 39 feet and a gross tonnage of 592 tons. The boat was built in the Image Marine yard in Australia and was launched in December 2002. Interior and exterior design is by Katherine Kng, the famous Singaporean architect. The 24 crewmembers look for and cuddle a maximum of 22 guests, offering an extraordinary service. Ten identical cabins - with a surface of 215 square feet! 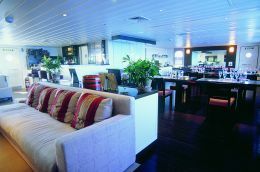 - are fitted with a surprisingly large "king size bed", uncommon on boats and a bathroom with bathtub and shower stall. The full- beam suite overlooking the sea is fitted forward and is remarkable. It is a small apartment with a total surface of 483 square feet and a private deck. As mentioned above, a diving dhoni follows the boat and is used for diving expeditions. Everyone may use Nitrox bottles and diving equipment, such as diving wetsuits, flippers, jackets and regulators may be rented onboard. Even though a vacation on the Explorer is dedicated to diving enthusiasts, it is perfectly conceived for non-divers as well for several daily activities are organized for those who are not fond of diving. Four inflatables and one boat are available for non- divers, in addition to several kayaks and sailboards. Guests may visit villages, stay on the beach, go on guided snorkeling tours, go fishing etc. 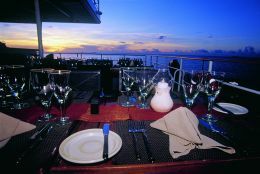 The meals offered onboard are excellent and extremely varied and the traditional Maldivian or Indian cuisine is especially tasty. 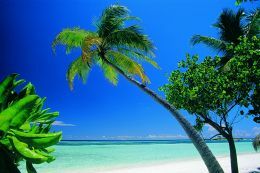 For further information visit the web site www.fourseasons.com/maldives. Cruises last three to seven days. Guests board either on the island of Kuda Huraa or by means of a small seaplane that reaches the cruising catamaran. Nowadays, there is a really wide choice of boats for cruising the Maldives. There are the classic boats, the first ones that sailed around the atolls, locally built, with full-bottom wooden hull, large foredeck and relatively small cockpit. Then there are the imported boats, such as small motoryachts and a few Turkish caiques. On our most recent holiday we sailed on an extraordinary aluminum catamaran especially built for the Four Seasons hotel chain. A deluxe boat, a real floating hotel dedicated to a small number of guests. 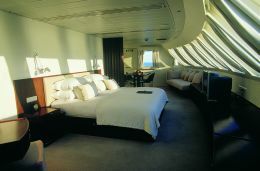 The staterooms are large with a king-size bed and bathtub; actually they do not appear as staterooms but as rooms with a view... a view on the most beautiful islands in the world. Just as it happens with all tourist boats, a traditional wooden dhoni follows our catamaran. Yes, this is in the Maldives' tradition: tourists live, rest and eat on the boat and then use the dhoni to reach the diving spots. All diving equipment, air bottles, the diving compressor are stored on the dhoni... so no one onboard will have to make sacrifices: diving enthusiasts use the dhoni to explore the seabed while the others relax on the yacht or on a deserted beach. Obviously, there are many possible itineraries. Generally, boats sail from Male atoll to the west, towards the large Ari atoll. Theoretically, tourists are forbidden to visit the farthest atolls to the south and to the north, this is why these are the most coveted destinations and sometime boat owners succeed in obtaining permits to sail there. Mystery and adventure, emotion and discovery, deserted islands and virgin seabeds, this is all true, but after much sailing in the Maldives I think that any itinerary, even the most common, doe not disappoint. 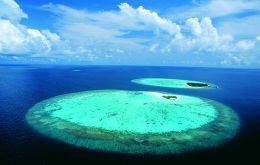 The diving spots that made the Maldives famous are at the center of the most visited areas. So do not break your head, let the captain plot the course and relax. Sailing southwards, the greatest differences are in the local villages. Maldivians are a gentle, hospitable and benevolent people. Unfortunately, many villages in the "tourist" area turned into bazaars, with rows of shops all selling the same products, lining the straight roads. In the south villages are different, they are typical, nothing is dedicated to tourists who are welcome, especially if they are not carrying a camera. As a matter of fact a young girl, with black hair and eyes as large as the sea surrounding her island, invited me to enter in her garden. Gently moving like Mowgli's girlfriend in the Jungle Book, and I was offered the tapioca she was frying but she did not give in to the flatteries of the glass eye of my Made-in-Japan camera. This may be explained by their religion: modern-day Maldivians are Sunni Muslims: no other religion is admitted. They are moderate Muslims, gentle, hospitable, yet unwavering in their traditions and beliefs. Yet, Islam has not always been their religion, legend has it that they were Buddhists, then, around 1153 a Moroccan shipwrecked arrived on the islands. Back then, in the full moon nights, a wild demon on his boat of fire approached the Maldive Islands exacting as tribute from the men the sacrifice of one young virgin. One day, Abdul Barakat met a desperate woman on the beach: she was the mother of the next victim. Abdul recited the psalms of the Koran and sang sacred songs to Allah, frightening the demon that fled and never returned. Since then Maldivians adopted the Muslim religion and today one can see the monument of Abdul Barakat in the center of Male, the capital. But let the monuments and legends slide and let us board in Male for the cruise. For us the adventure starts from the beautiful Four Seasons Resort in Kuda Huraa island, in the Male atoll. We spent two days on land in order to adapt to the new climate and local time and to recover from the long flight, benefiting from the brand new spa - the hotel's flagship - created on a small sandy islet. From here we sailed onboard the Four Seasons Explorer and reached Bandos after a short ride where, after dropping the anchor on the sandy seabed, we enjoyed a lobster-based dinner with sunset on the Maldive Islands. At dawn we leave the atoll and we point the boat's head towards Raasdhoo for two dives in the famous pass where we have a nice surprise. All of you will certainly remember that a few years ago, global warming - probably due to a change in the course of El Nino's stream - caused a widespread and catastrophic death of corals. Well, during this first dive, we were surprisingly swimming over a field of delicate funnel-shaped young colonies of corals three to four feet in diameter. They were all very similar meaning that the sea is starting to recover and that the coral is reproducing itself very fast, getting the seabed back and helping the sea to return to its original conditions. While we admire the corals, we see a couple of sea eagles flying in the blue sky, while two sharks warily swim around us. 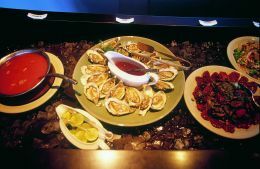 They are not the sole inhabitants of this stretch of ocean: sea breams with their menacing mouth, giant meek Napoleon fish and darting silver carangids meet at the pass. Diving is not the sole activity onboard. An "expedition" sails on the tender to a deserted island for a dip in the small pristine crystal-clear lagoon with no rocks, no algae: a perfect pool with coral sediments bottom. Our course is set toward Ari atoll, another forced stop for most cruising vessels. Similarly, a dive in Maya Tilla is a must. 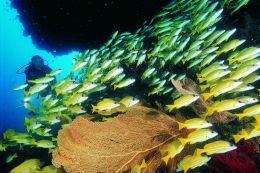 This coral pinnacle in the middle of the sea, once known for the abundance of sharks, today is also appreciated for its large black coral trees, the unfailing sea turtles and the packed schools of yellow and blue midnight snappers. At dawn a sea like a millpond surprises us: we have breakfast on deck, facing the tiny Meerufenfushi islet... Actually it is not really an islet, rather a patch of sand that can be visited in a few minutes, with a tuft of bright green palm trees at the center and surrounded by an emerald green lagoon. It is here that our day starts and finishes, with a fantastic relaxing swim at sunset, after spending the full day sunbathing and diving. In the evening, the Indian dinner on deck is lit by tiny candles that do not succeed in dampening down the starlight. The next morning we live one of the most beautiful moments of the cruise. It is still dark when we get up. We load the dhoni to start the new day together with the sun, to watch the sea awakening, it is still dark down there. Looking up at the sky we see the first light of day, the sea surface is silvery, mottled by the wind and by the sharp and violent rays. Looking down at the sea everything is still dark gray and heavy. Then near the surface, inside that immense black cloud that overshadows us, something happens. A school of small fish huddles trying to escape from predators, the fusileers continuously move in our watery sky as a stormy cloud and the fast carangids deadly fling themselves at the school provoking its explosion into a thousand splinters. A large and mild Napoleon fish swims over the shoal, it will not attack the small fish but two carangids use it to hide behind its large body and attack; again, the only thing the small fish can do is escape. We watch this precise screenplay, which seems to have been written by an expert screenwriter. The preys open up and close down behind the astonished predator, they are ready to continue their number hoping the bad luck will attack others. While this occurs near the surface, a couple of large marine turtles peacefully graze among the corals on the seabed. At the end of the dive we, too, are ready for breakfast before swimming again in the waters of the shoal or going on a fishing expedition. Our breakfast is not based on algae and raw fusileers, for pity's sake... rather we are offered warm croissants just taken out of the oven, fresh fruit and eggs on request. The fishing battue is successful, fish will be the main course of an elegant barbecue on the beach at the light of small torches: the table is obtained with dug sand covered by a colored tablecloth. This too is part of the atmosphere of a cruise in the Maldive Islands: an evening spent on the beach with a barbecue dinner and some time spent at looking at the stars and moon through a telescope. Then a new day on the sea: the Broken rock seabed await us, racked by rifts and recesses rich in fish and gorgonians. The Explorer is moored in front of Dhangeti Island and a second dive awaits us. We set sail with the doni, Kudarah tilla is splendid: here there is the best seabed one might expect to find at the Maldives. There are beautiful gorgonians decorated by multi-colored crinoids, pinnacles of madrepores top rocks and we admire the corals that are lushly growing again after the great disaster. A myriad of colored fish swim in this beautiful environment rich in coral life. There are red squirrel fish, boundless schools of midnight snappers, orange and rose Anthias swimming along the seabed. Even morphology is especially beautiful: there are series of madrepore channels and underwater decorated arches of gorgonians. The current gives us no quarter, but the show is so fascinating that we are not bothered by it. We are still in the Ari atoll. We are ready to set sail, the course is set on Felidu Atoll, a place that in our opinion should be a "must" of any cruise in the Maldive Islands. It is a tiny and uninhabited atoll, a simple strip of sand. Everyone on board agrees on remaining here a couple of days. Underwater we find ourselves flying over the sides of this beautiful pointed mountain that rises from the depths. This mountain is literally covered with pastel colored alcyonarians. They hang from the spurs, covering the whole mountain side; some cling to the rocky arches under which we are able to swim and below us we admire multitudes of gorgonians, carousels of big silvery carangids, large and solitary sharks moving elegantly. Alcyonarians cover the vaults of ample caves and a host of red and white corals rise from the seabed, large tropical unbras hide in this sea forest. The current appears to be a blowing wind moving the tops of the largest gorgonians, hanging over the abyss. At night, nobody resists to the temptation of having dinner on that tiny spot of sand miraculously surfaced from the depths. We eat under a deep blue and starry sky while all around us the lightnings of a storm fire up with reddish light dense clouds loaded with rain. This sight is uncommon for these islands that are flooded by sunlight, but it is a sight which clearly remains in our minds and hearts, a vivid witness of the wild beauty of this extraordinary archipelago.